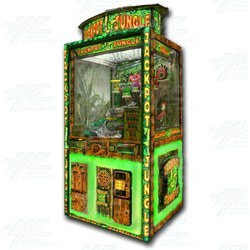 Jackpot Jungle is a ticket redemption arcade machine from Namco America which is all about strategy and skill. It is creatively designed for today's market, with fantastic play appeal and player loyalty for all ages. The game has heaps of features, including multi-coins, multi-jackpot, multi-balls, multi-games and multi-strategy. Simply play 1-5 balls to shoot at several targets and by hitting or landing in specific targets, players can win up to four jackpots! This incredibly popular machine's simple and fun game play, and eye-catching cabinet art, will attract players from all across the floor. The game has heaps of features, including multi-coins, multi-jackpot, multi-balls, multi-games and multi-strategy. Simply play 1-5 balls to shoot at several targets and by hitting or landing in specific targets, players can win up to four jackpots! This incredibly popular machine's simple and fun game play, and eye-catching cabinet art, will attract players from all across the floor.